Groups are happy to tour this museum that is listed in the National Geographic Guide to America’s Great Houses. The Victorian tea and hospitality, the complete 19th century collection of furnishings that is not roped off, and the quality craftsmanship of the home make the Afternoon Tea and Tour a favorite. With its elegant but comfortable tea room in the Servant Quarters seating up to 45 at tables, the Clayton House is a popular attraction for motorcoach groups and other large groups. A one-and-a-half hour Afternoon Tea and Tour features a hospitable welcome with warm teas served from silver tea service, along with delicious scones and jam. Following a greeting and brief history given by “Florence Clayton,” a lively museum tour begins. This event can be scheduled between 1:30 and 4:00 p.m. and costs $15 per person. A minimum of 15 guests is required. 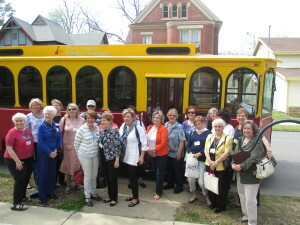 For more information or to book your upcoming group tour event at the Clayton House, contact us or call 479-783-3000.